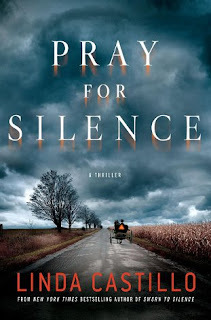 In the quiet town of Painters Mill an Amish family is found slaughtered on their farm. Kate Burkholder and her small police force have few clues, no motive and no suspect. Formerly Amish herself, Kate is no stranger to secrets, but she can’t get her mind around the senseless brutality of the crime. State agent John Tomasseti arrives on the scene to assist. He and Kate worked together on a previous case, and they’re still setting the limits of a complex, difficult relationship. They soon realize that the disturbing details of this case will push those boundaries to the breaking point. When Kate discovers a diary, she realizes a haunting personal connection to the case. One of the teenage daughters kept some very dark secrets and may have been leading a lurid double life. Driven by her own scarred past, Kate vows to find the killer and bring him to justice—even if it means putting herself in the line of fire. Linda Castillo pens her second thriller bringing back a cast of characters which include a female chief of police with her small town police force, and the love interest who was featured in the previous novel. The chief of police, Kate, is the main protagonist going through the motions of a CSI episode written in present tense and offers the same amount of ick factor at the gore. An Amish family is slaughtered in Ohio, and Chief Kate is hot on the pursuit of the suspects, except she cannot find them. Kate seems pretty young to be the chief of police at age 32. She is pretty tough though and manages to keep her head on straight 95% of the way through the case. She has scant evidence, and zero leads for quite awhile, and so the reader was privy to Kate asking many questions of many people. The story leads us through each small discovery as it happens, and we get a glimpse of the supposedly handsome Tommasetti. There are a few suspects, from a boyfriend that a young daughter of the Amish family wasn't supposed to have, and mere acquaintances from a store, to the riff raff criminal element of the town. Scummy people are everywhere as Kate looks for clues, and as any good cop should, she feels responsible for finding the killer. Slowly the author eludes to a hidden meaning as to why Kate feels so empathetic towards the young daughter and was only one of the few surprising things in the novel. There was a lot of insight into the lifestyle of the Amish people in Ohio, which I found interesting. Once the case started moving along and the suspect list grew, we had an idea of who the killer was. The story then takes on the task of discovering how and why. Since this is a 'thriller' type of read, it is not for the faint of heart. The murders were gruesome and particular carnage was spelled out. Once it got past that, it was all detective style with a slightly annoying romantic relationship in the background. All in all, it was as expected, a page turner that was slightly addicting, although in hindsight I can't explain why the need was so demanding to force me to stay awake to finish it, though I grew tired of the multiple references to the Slaughterhouse case from the previous novel. Given the fact there are high ratings on Amazon, this is probably a great read for those who like the thriller genre. 1. What did you think of PRAY FOR SILENCE? It probably achieved what the author was intending with this thriller, it was entertaining.. and see review above. 2. How would you describe this book to a friend? 3. How does this title rate compared to other thrillers you’ve recently read? I do not read more than 2 thrillers a year, but I do enjoy mysteries. I am glad that this thriller was not as lewd or gory as others I have read. 4. Would you read another novel by Linda Castillo? 5. Do you have any questions for Linda Castillo? Not at this time, thank you. P.S. There is a previous novel in the series, as mentioned, and rumor has it that Linda Castillo is working on book #3 for the series as well. If that is the case, I hope the author does something specific with the love interest between Kate and John, because that theme brought the rest of the novel down. Sunday Salon: Tudor Mania Results! Another fantastic opportunity to review..